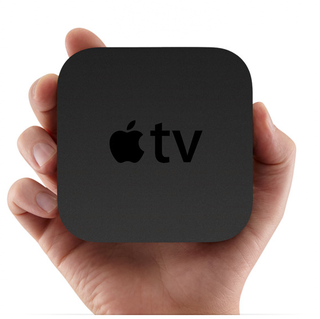 The new Apple TV is small — hockey-puck small. That's impressive, but we all know size doesn't matter, whereas speed does. I was pleasantly surprised at how quickly it connected to the iTunes library on my desktop computer. The Apple TV does this noticeably faster than its ancestor using a 'home sharing' option, which connects with any iTunes account in your household — Mac or PC. The biggest new thing about the Apple TV is the feature my mom will like the most: If you're a Netflix subscriber you can watch movies instantly on it. Every web-enabled TV component can do that these days, including game consoles like the Xbox 360 and Sony PS3 and dedicated boxes from Roku and Boxee, so it's an expected feature. But on the new Apple TV it's fast, easy to set up, and easier for consumers like my mom to appreciate. The new Apple TV is very promising, but it won't amount to hill of beans if Apple markets it the same way they did the last one — basically not at all. Apple can jokingly call it a 'hobby,' but if the company wants it to be a successful hobby they need to educate consumers the same way they did with the iPad. Compact design. Intuitive user interface. Streams video, music, and photos from your computer, iPad, iPhone, or iPod touch. 99-cent TV-show rentals. Streams Netflix Watch Instantly content, YouTube, and content from iOS devices to Apple TV. No hard drive. Can't purchase content-streaming only. Can't rent a show on Apple TV and watch it on other devices or your computer. Limited rental content available. Connects via HDMI-not compatible with older televisions without purchasing adapter. Doesn't ship with an HDMI cable. A lower price, a more compact design, and the ability to stream content from iOS devices and rent 99-cent TV shows makes Apple's latest Apple TV set-top box an excellent option for iTunes and Netflix users. Those are the earliest reviews to hit the web. We'll update as more become available.